Fraudulent activity continues to challenge our industry and threaten our reputation in the research ecosystem. It’s more important than ever for market researchers in all parts of the industry to fully understand what we’re up against – the fraudulent tricks and dirty dealings that are pulling us down and influencing public perception. That’s why Mark and I are back this year with our newest look at the emerging trends in cyber-fraud. 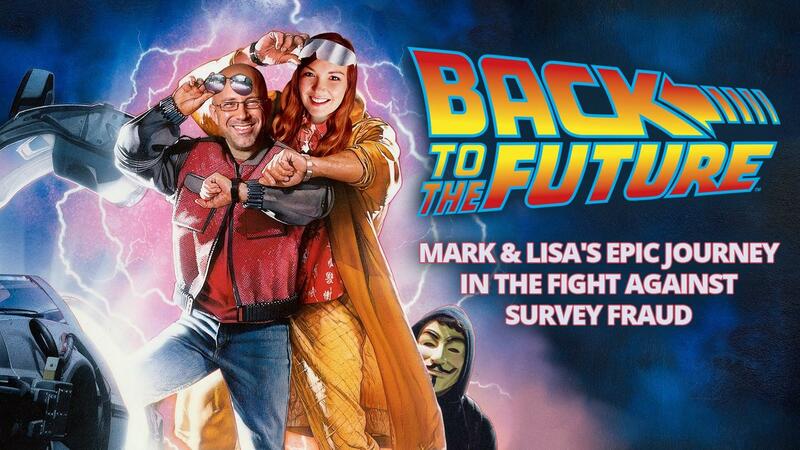 In Back to the Future: Mark & Lisa’s Epic Journey in the Fight Against Survey Fraud, we take a closer look at the last 12 months in the market research industry and how cyber-fraud has influenced them. Presented at SampleCon with an encore webinar scheduled for early March, this deep dive into the dark arts of fraudsters will look at three commonly used tactics and actionable tips for how to mitigate this kind of risk. This is an economic pandemic and is forecast to continue growing, with upwards of $6 trillion in losses expected by 2021. And the impacts are spread evenly – impacting billion-dollar global brands, social media giants, government institutions and small businesses alike. The market research industry isn’t immune to these threats. In fact, cyber-criminals have long targeted market research in their crimes and have only grown more sophisticated in recent years. The financial motivations are massive, and the methods used advanced. Criminals are populating surveys with fake data to take advantage of survey incentives on a grand scale. Combined with the impact this kind of fraud has on public perception and trust of the market research industry, it’s time to act. Emerging trends in cyber-fraud, the hotspots for fraud in 2018 and what new themes are expected to emerge over the next 12 months. Common tactics used by fraudsters, with a live presentation on how they do it. How to implement effective solutions that have a positive impact on market research businesses and the data quality delivered to clients. You can also signup to request a copy of the presentation when it's available here. Signup now to receive an invite for the upcoming webinar encore as soon as it is scheduled.